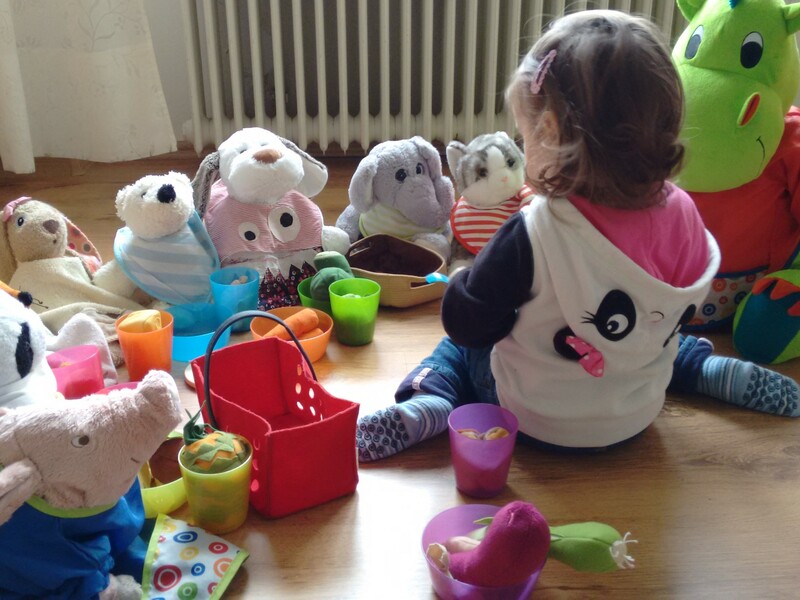 Birdy’s age of pretend play arrived around a year ago when she begun to equip soft toys with bibs and spoon-feed them. Soon afterwards they were assigned a bowl and a spoon and were expected to feed themselves. These days we often have to wait for a green light to cross the hallway from the living room to the kitchen. There are trains running up by the living room ceiling, and when we lie down on the floor we’re looking at the stars. We’re having lengthy phone conversations using items as varied as wood bricks and legos, and feeding the soft toys is a grand scale event. Most of these and other pretend play scenarios are easy enough to decipher. Birdy is learning traffic rules, we recently visited a museum full of miniature trains, we’re reading a kids yoga book on a daily basis, and she sees us talking on the phone and cooking meals often enough. But I was quite unprepared when one day during breakfast our 2,5 year old announced that we have company. A blond haired and green-eyed boy named Emil was apparently standing by the living room door. Over the weeks Birdy’s imaginary friend has developed from a bystander into a companion and a playmate. He’s not there all the time, not even every day. But when Emil makes an appearance she’s quite keen to order him around. Sometimes he also accompanies us when we go out on the weekends. Then Birdy chooses a pair of shoes for herself and her friend, and we have to keep the door open for him, and make sure to take him with us when we get off the bus. We briefly wondered whether the appearance of imaginary friends means that we’re not playing enough with our daughter. Fortunately reading up on the matter set our minds at ease. Half the time I’m a little unsure how to treat a friend that I cannot see. But that doesn’t stop me from shamelessly exploiting him for my own purposes. Need an extra motivation to get ready to leave the house in the mornings? Emil is coming too, why don’t you join him and help by finding him some shoes? And hey, having imaginary friends means that Birdy always has someone to play with! Imagination is a wonderful thing and I’m looking forward to seeing where it takes us in the months and years to come.